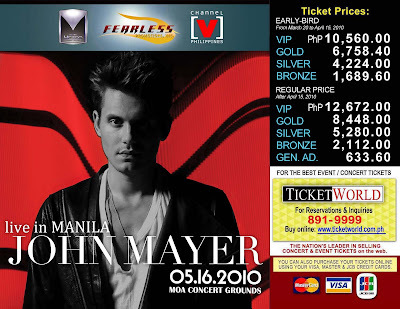 For everyone who's been asking me about tickets to the John Mayer concert here in Manila, I am posting the downloadable poster from Ticketworld for your reference. Early birds will get discounts until April 15. The website said that the VIP, GOLD and SILVER sections have reserved seatings. BRONZE section will also have seats on a first come first served basis. General admission tickets are standing room only. Ticketnet also listed on their site the things that are prohibited inside the venue. Alcoholic drinks, weapons, firecrackers are definitely out but seriously, there are people who watch concerts carrying LARGE CHAINS? Whoa!